If you have a son and are wondering if it really is harder to potty train boys, you are not alone. It depends on who you ask but most people say potty training boys is a little more difficult than girls. Sales of our book, My Potty Reward Stickers for Boys also show a slightly higher demand for potty training boy books, so when we believe training boys is definitely more challenging! Little boys have twice the task. They stand and they sit. Boys are generally slower to mature, so this may play a role in their attention span and understanding. The reward system is most popular. Our sticker books of 126 mini-stickers last a long time, allowing parents to go train at their child’s pace. MOM Designed / CHILD Approved ! All children are different and many parents encounter some resistance when potty training boys, and you are not alone in your challenge to train. Stickers make potty training toddlers a little more fun! 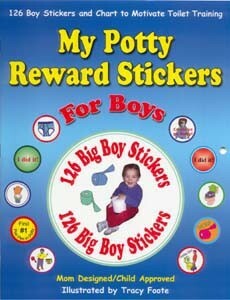 Motivate and reward your potty training boy using full color stickers. After successful potty attempts place a sticker on your boy’s shirt or use the potty training chart provided. Save time: Train faster and stop expensive diaper purchasing sooner! Check the customer comments to find testimonials and reviews on My Potty Reward Stickers for Boys. when we introduced the sticker chart he was SO excited! It was only a matter of a week before he was out of diapers! I highly recommend this to supplement potty training. My son expressed to me the difficulties he and his wife were having to motivate their 2 1/2 year old to be potty trained. I sent them this chart and the potty reward stickers, and my Grandson loves them. His parents showed him the chart and stickers and told him he could only use them after he used his potty. Shortly after that he came up to his Dad and said, “I want to go on the potty like a big boy.” After he did, he ran out of the bathroom looking for his stickers. His parents are amazed how much My Potty Reward Stickers for Boys has motivated him to be trained. I found Tracy Foote’s “My Potty Reward Stickers for Boys” to be an excellent visual tool to help motivate my son to want to go potty and feel good about himself and the whole process. We had watched various potty training videos, sat on the potty reading books, even used role-playing with a baby doll who wets and has her own potty when we started the training process. But not until we used this booklet, did we see results that took off quickly. would be enough stickers, but by the end, my son was doing very well with peeing in the potty, and starting to poop in the potty as well. (With boys, pooping usually takes longer.) My son had fun choosing a reward sticker whenever he successfully went potty; there are enough pictures of the various potty training steps (e.g., sitting on the potty, wearing underwear, staying dry, washing hands, etc.) to praise a well-done job. After a while, to increase motivation, we would give our son an extra treat for completing an entire row or two (of 8-16 stickers); sometimes we’d use his favorite – M & M’s, other times we’d pull out a new inexpensive toy or book. What worked well for my son was being able to visualize how many more blank circles he had to fill up with stickers in order to complete a row and then get his reward. Could someone make their own chart with stickers? Sure, but for those of us who are pressed for time, this lays it all out for you in a nice, neat, fun and easy to use format. It serves to stimulate, motivate, and provide positive reinforcement, all at your fingertips, which was worth the money in my opinion. Another plus is that the author has customized the system for not only boys, but girls too. I had ordered the girls version to give as a present, and due to some mishaps, had a problem, which the author herself personally corrected immediately. Kudos to Tracy Foote for developing a product that helps ease the stress of potty training while providing both parent and potty training boys the confidence needed to get through this developmental milestone in a fun manner. We were having trouble getting our 4-year-old son to consistently go potty. It was becoming contentious and our boy was getting self-conscious and embarrassed – this was not good… This no-frills, no-psycho-babble booklet is a perfect approach. It immediately became fun for our son. He was quickly proud of his successes. The potty training quickly lost any negative aspect in his mind. It became the highlight of his day and a source of pride. WITHIN ONE DAY HE WAS READY. ONLY 3 ACCIDENTS TO REPORT IN THE FIRST 3 WEEKS – INCLUDING OVERNIGHT !!! IF YOU NEED HELP WITH THE POTTY – BUY THIS BOOKLET!! I am writing to THANK YOU for these stickers and book. I trained my son in less than 4 days, he had never been the least bit interested before these potty training boy stickers! He loved them so much, it went unbelievably well, and we think the stickers were just what we needed for him! AGAIN, thank you for this product that truly worked for us in INDIANA! the trick. The stickers could be of better quality (color and gloss). We told him if he filled up the sticker poster he could pick out a brand new toy. Every child is different and the way they learn to use the potty is unique. You can try to stick to a regimented program that may only serve to cause you and your child stress. Personally, we have allowed Malcolm to take the lead in his potty training journey. We have helped him along with encouragement, gentle reminders, but he is in control. The beautiful thing about Tracy Foote’s, My Potty Reward Stickers for Boys is that they can be used with any potty training method you use. Rewards are an excellent motivator. With Tracy Foote’s booklet, the motivator is the potty training sticker chart. We’ve seen other potty training sticker charts and they only have space for about 20 stickers or so. Although there may be some children who are trained that quickly…most are not. This is a nice big chart that allows children time to develop their good bathroom habits. Malcolm has enjoyed the “fireman” stickers and the other potty training stickers with big potty training boys to look up to. We’re not at the end of our potty training journey yet, but before we got this sticker book…we had trouble getting him motivated. can see his progress. Plus, he shows all our visitors all the stickers he has earned. I let him choose the sticker and he really enjoys seeing the little potty training boys and the ones with toilet paper and sinks. When his dad gets home from work, he takes him by the hand to the bathroom to show how many stickers he has gotten that day. All in all, I think the stickers have helped us speed up this process. Use this musical potty to teach cause and effect. The musical potty plays when your child is successful! Set an example using special dolls with your potty training toddler. This is a favorite way to potty train, by pretending with your toddler. Play house but incorporate the potty ideas too! offer this book on our site. Have a special book that is only read while sitting on the potty. This one works well. This book has very cute drawings. We like the way there is an animal throughout making it a very friendly book.